Cuba, also known as the Republic of Cuba, is a country that consists of the island of Cuba (the largest of the Greater Antilles), the Isle of Youth and adjacent small islands. Cuba is located in the northern Caribbean at the confluence of the Caribbean Sea, the Gulf of Mexico and the Atlantic Ocean. Cuba is south of the eastern United States and the Bahamas, west of the Turks and Caicos Islands and Haiti and east of Mexico. The Cayman Islands and Jamaica are to the south. Fidel Castro, speech at Ernesto "Che" Guevara's memorial service on October 18, 1967. It is with regret that I have again to announce a continuance of the disturbed condition of the island of Cuba. No advance toward the pacification of the discontented part of the population has been made. While the insurrection has gained no advantages and exhibits no more of the elements of power or of the prospects of ultimate success than were exhibited a year ago, Spain, on the other hand, has not succeeded in its repression, and the parties stand apparently in the same relative attitude which they have occupied for a long time past. This contest has lasted now for more than four years. Were its scene at a distance from our neighborhood, we might be indifferent to its result, although humanity could not be unmoved by many of its incidents wherever they might occur. It is, however, at our door. I can not doubt that the continued maintenance of slavery in Cuba is among the strongest inducements to the continuance of this strife. A terrible wrong is the natural cause of a terrible evil. Ulysses S. Grant, Fourth State of the Union Address (2 December 1872). 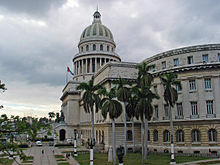 The existence of African slavery in Cuba is a principal cause of the lamentable condition of the island. Ulysses S. Grant, Fifth State of the Union Address (1 December 1873). Douglas was a radical expansionist. Both parts of the Democratic Party in 1860 called for the annexation of Cuba. And there were 100,000 slaves in Cuba, and Cuba was the place that slaves were still being brought from Africa and then resold in the United States. So under a Douglas presidency, we would have taken over the rest of Mexico and Central America whenever we had the resources and the appetite to take to do so. Harry V. Jaffa, The Real Abraham Lincoln: A Debate (7 May 2002), The Independent Institute. Kennedy would have ordered nuclear retaliation on Cuba — and perhaps the Soviet Union — if nuclear weapons had been fired at United States forces. Robert McNamara, U.S. secretary of defense under President John F. Kennedy, according to The New York Times; On the Brink of Nuclear War, Awake! magazine, May 22, 1992. Today, Cuba is still governed by the Castros and the Communist Party that came to power half a century ago. Neither the American, nor Cuban people are well served... It was a Cuban, Carlos Finlay, who discovered that mosquitoes carry yellow fever; his work helped Walter Reed fight it. Cuba has sent hundreds of health care workers to Africa to fight Ebola... I'm under no illusion about the continued barriers to freedom that remain for ordinary Cubans. Barack H. Obama II, "Statement by the President on Cuba Policy Change" (17 December 2014). Louis A. Pérez., as quoted in The War of 1898: The United States and Cuba in History and Historiography. Chapel Hill: University of North Carolina, 1998. Print. A few moments ago, the body was treated to a report from the senator from Iowa about his recent trip to Cuba. Sounded like he had a wonderful trip visiting, what he described as, a real paradise. He bragged about a number of things that he learned on his trip to Cuba that I'd like to address briefly. He bragged about their health care system, medical school is free, doctors are free, clinics are free, their infant mortality rate may be even lower than ours. I wonder if the senator, however, was informed, number one, that the infant mortality rate of Cuba is completely calculated on figures provided by the Cuban government. And, by the way, totalitarian communist regimes don't have the best history of accurately reporting things. I wonder if he was informed that before Castro, Cuba, by the way, was 13th in the whole world in infant mortality. I wonder if the government officials who hosted him informed him that in Cuba there are instances reported, including by defectors, that if a child only lives a few hours after birth, they're not counted as a person who ever lived and therefore don't count against the mortality rate. Marco Rubio, speech to the United States Senate (24 February 2014). This page was last edited on 27 October 2017, at 00:49.